Danny Rowe’s first-half strike was enough to seal an FA Cup victory over National League rivals Wrexham as Fylde won through to the first round proper for the fourth time in six seasons. 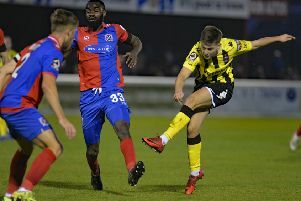 Top scorer Rowe slotted home eight minutes before the break to earn the Coasters a thoroughly-deserved victory and a place in Monday evening's draw. Manager Dave Challinor made three changes from side beaten at Sutton United seven days earlier, with the injured Jordan Tunnicliffe and the suspended Lewis Montrose replaced by Mill Farm debutants Jason Taylor, while Jordan Richards came in for Tom McCready. The Coasters were first to threaten, when Luke Burke’s teasing cross was turned behind and Simon Grand’s header from the resulting corner looped on to the top of the net. Momentum was with the hosts and Jack Muldoon was unlucky to see his header fly over after he was exquisitely picked out by strike partner Rowe. Zaine Francis-Angol almost found his way clean through at the midway point of the half when he skipped past James Hurst, though the Wrexham full-back was adjudged to have handled the ball and was shown a yellow card. Wrexham tested the Coasters backline moments later, when Scott Boden laid the ball off to Marcus Kelly on the edge of the area but Grand was in the right place to deflect the ball over the top. A relatively uneventful opening period was brought to life on 37 minutes when Muldoon turned his man 20 yards from goal and slipped in Rowe, who made no mistake with a calm first-time finish into the bottom corner. Sam Finley was presented with a glorious chance to double the lead soon after, when he was picked out by Andy Bond inside the penalty area, but Dragons stopper Chris Dunn was equal to his vicious strike. Fylde kicked off the second half in the same vein and were a whisker away from adding to their tally when Rowe’s free-kick from 25 yards whistled inches wide of the post. A bright start to the half saw opportunities for both sides as James Jennings’ deep cross for Wrexham narrowly eluded Boden at the back post before Grand headed just over from Richards’ corner at the other end. Another whipped ball from Jennings almost brought about the equaliser but Boden fired just wide at the far post. Boden was proving a handful and Fylde keeper Jay Lynch had to be alert to tip the frontman’s glancing header around the post. Rowe dragged an effort wide as the home pressure started to build and he perhaps should have done better when looking for Muldoon after beating his marker down the right. It was one-way traffic as the full-time whistle approached and substitute Jamie Stott almost made a dream start to his Coasters career but diverted Finley’s long-range attempt narrowly wide. The draw for the first round will begin at around 7.10pm on Monday and will be televised live on BBC Two and BT Sport. AFC Fylde: Lynch, Burke, Grand, Edmundson, Francis-Angol, Richards (Stott 69), Bond, Finley, J Taylor (Smith 76), Muldoon (Tasdemir 80), Rowe; subs not used: Hardy, R Taylor, McCready, Blinkhorn. Wrexham: Dunn, Hurst (Rutherford 46), Jennings, Smith, MacKreth, Wedgbury, Holroyd, Carrington, Marx, Kelly, Boden (Massanka 64); subs not used: Dibble, Roberts, Smith, Tharme.